So it looks like we are ready to. The idea follows the SLFtalk pattern, folk can record and send audio by a variety of methods to the site; audioBoo, gabcast, mailing mp3s direct from a phone or iPhone. Instructions are on the site, liked from the sidebar. This time we have added Skype recordings with Pamela into the mix and ipadio. Quite a few people asked for ipadio support in SLFtalk but it was not possible at that time. Last week I did a bit of testing with ipadio and found it didn’t have a RSS feed for specific tags (this is how we push audioBoo onto the site), but I did get a nice welcome email for ipdaio. I replied to this suggesting the feature, and within a day or two the developers had added it! 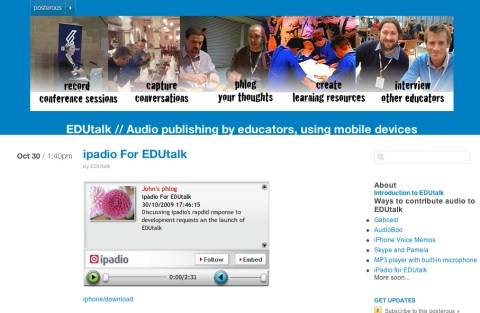 You can now record an ipadio phlog tag it EDUtalk and it will turn up on EDUtalk.cc. As with posterous helping out by adding to their API I continue to be very pleasantly surprised with how developers provide us with free products and then alter them on request. I’ve also improved my system for creating posts from audioBoo and ipadio, by changing the html a bit we now ebed the audioBoo and ipadio players and by using feedburner the audio will be in the RSS feed. I am very excited about the project, listening to the audio from SLFtalk provided a different dimension to reading blogs or watch video recordings. I hope other people are too. Anyone interested is invited to the flashmeeting (Just DM me or David for a link) and to start submitting audio next week you ght even win a prize.